Mass The mass of the object (in kilograms by default). Drag How much air resistance affects the object when moving from forces. 0 means no air resistance, and infinity makes the object stop moving immediately. Angular Drag How much air resistance affects the object when rotating from torque. 0 means no air resistance. Note that you cannot make the object stop rotating just by setting its Angular Drag to infinity. Use Gravity If enabled, the object is affected by gravity. Is Kinematic If enabled, the object will not be driven by the physics engine, and can only be manipulated by its Transform. This is useful for moving platforms or if you want to animate a Rigidbody that has a HingeJoint attached. 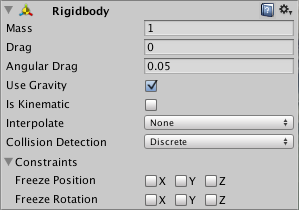 See in Glossary Try one of the options only if you are seeing jerkiness in your Rigidbody’s movement. See in Glossary is applied. - Interpolate Transform is smoothed based on the Transform of the previous frame. - ExtrapolateThe process of storing the last few known values and using them to predict future values. Used in animation, physics and multiplayer. See in Glossary Transform is smoothed based on the estimated Transform of the next frame. See in Glossary. Other colliders will use discrete collision detection when testing for collision against it. Used for normal collisions (This is the default value). See in Glossary against Rigidbodies and Colliders. This is also the only CCD mode that you can set kinematic bodies. This method tends to be less expensive than sweep-based continuous collision detection. - Freeze Position Stops the Rigidbody moving in the world X, Y and Z axes selectively. - Freeze Rotation Stops the Rigidbody rotating around the local X, Y and Z axes selectively. See in Glossary directly. Generally, you shouldn’t manipulate the Rigidbody and the Transform of the same GameObject - only one or the other. See in Glossary. This is why you should only be using one or the other. Changing the Transform while using physics could cause problems with collisions and other calculations. See in Glossary or a Joint to get it to behave exactly how you want. When an object is under physics control, it moves semi-independently of the way its transform parents move. If you move any parents, they will pull the Rigidbody child along with them. However, the Rigidbodies will still fall down due to gravity and react to collision events. See in Glossary to add forces or torque. You do this by calling AddForce() and AddTorque() on the object’s Rigidbody. Remember that you shouldn’t be directly altering the object’s Transform when you are using physics. For some situations, mainly creating ragdoll effects, it is neccessary to switch control of the object between animations and physics. For this purpose Rigidbodies can be marked isKinematic. While the Rigidbody is marked isKinematic, it will not be affected by collisions, forces, or any other part of the physics system. This means that you will have to control the object by manipulating the Transform component directly. Kinematic Rigidbodies will affect other objects, but they themselves will not be affected by physics. For example, Joints which are attached to Kinematic objects will constrain any other Rigidbodies attached to them and Kinematic Rigidbodies will affect other Rigidbodies through collisions. Colliders are another kind of component that must be added alongside the Rigidbody in order to allow collisions to occur. If two Rigidbodies bump into each other, the physics engine will not calculate a collision unless both objects also have a Collider attached. Collider-less Rigidbodies will simply pass through each other during physics simulation. In the above picture, the Gun Model GameObject has a Rigidbody attached, and multiple primitive Colliders as child GameObjects. When the Rigidbody parent is moved around by forces, the child Colliders move along with it. The primitive Colliders will collide with the environment’s Mesh Collider, and the parent Rigidbody will alter the way it moves based on forces being applied to it and how its child Colliders interact with other Colliders in the Scene. Mesh Colliders can’t normally collide with each other. If a Mesh Collider is marked as Convex, then it can collide with another Mesh Collider. The typical solution is to use primitive Colliders for any objects that move, and Mesh Colliders for static background objects. See in Glossary to make the simulation more precise, if you run into problems with fast moving objects. See in Glossary. Unity’s default unit scale is 1 unit = 1 meter, so the scale of your imported mesh is maintained, and applied to physics calculations. For example, a crumbling skyscraper is going to fall apart very differently than a tower made of toy blocks, so objects of different sizes should be modeled to accurate scale. If you are modeling a human make sure the model is around 2 meters tall in Unity. To check if your object has the right size compare it to the default cube. You can create a cube using GameObject > 3D Object > Cube. The cube’s height will be exactly 1 meter, so your human should be twice as tall. See in Glossary and choosing Assets->Import Settings… from the menu. Here, you can change the scale and re-import your mesh. If your game requires that your GameObject needs to be instantiated at different scales, it is okay to adjust the values of your Transform’s scale axes. The downside is that the physics simulation must do more work at the time the object is instantiated, and could cause a performance drop in your game. This isn’t a terrible loss, but it is not as efficient as finalizing your scale with the other two options. Also keep in mind that non-uniform scales can create undesirable behaviors when Parenting is used. For these reasons it is always optimal to create your object at the correct scale in your modeling application. The relative Mass of two Rigidbodies determines how they react when they collide with each other. Making one Rigidbody have greater Mass than another does not make it fall faster in free fall. Use Drag for that. A low Drag value makes an object seem heavy. A high one makes it seem light. Typical values for Drag are between .001 (solid block of metal) and 10 (feather). If you are directly manipulating the Transform component of your object but still want physics, attach a Rigidbody and make it Kinematic. If you are moving a GameObject through its Transform component but you want to receive Collision/Trigger messages, you must attach a Rigidbody to the object that is moving. You cannot make an object stop rotating just by setting its Angular Drag to infinity.